Special Features: Powder-free synthetic contains no natural rubber latex proteins. Soft, flexible, PVC polymer is bonded with a polyurethane interior, creating a wonderfully comfortable non-latex glove. 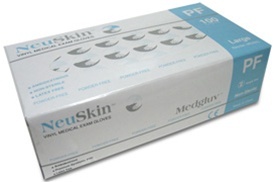 NeuSkin Vinyl Powder Free Examination Gloves provide a latex free and powder free solution to hand protection. Formulated from a special synthetic component and soft PVC material, these gloves are more elastic to fit snugly and comfortably to the hands for even the toughest job.